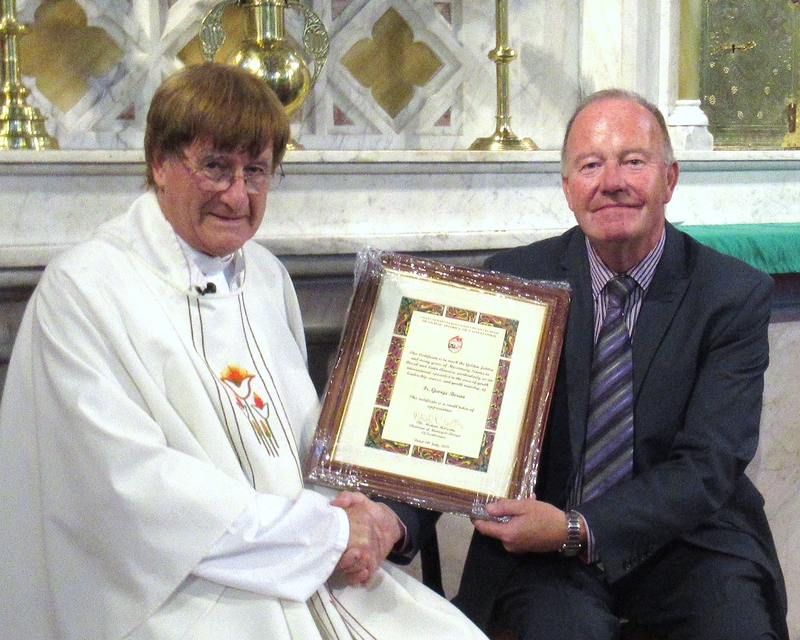 Friends, relations and parishioners turned up in great numbers on Saturday evening for a very special occasion in the Church of the Immaculate Conception, Castlecomer. The Vigil Mass, con-celebrated honoured the occasion of the Golden Jubilee of the Ordination of Fr George Boran CSSp, Clashduff, Castlecomer. Fr George was born in Castlecomer on January 25, 1941, and ordained to the priesthood as a member of the Holy Ghost Congregation (Spiritans) on July 7, 1968. Since 1969 he has worked as a missionary in Brazil and Latin America. Fr George resides in Brazil and is an international specialist in the area of youth leadership training and youth ministry. He has given conferences and courses in different countries in Latin America, Europe, Africa, United States and in the Ukraine. He is a founder member and presently co-ordinator and director of the National Youth Training Center, CCJ, in Sao Paulo and is currently also a member of a Commission for Formation material for youth for the Brazilian Bishop's Conference. Following his Ordination in 1968, Fr George was appointed a missionary in Brazil the following year. 1970 - Curate Parish of Presidente Bernardes, State of Sao Paulo; 1973 - Parish Priest of Parish N. Sra. do Carmo, Vila Alpina, city of Sao Paulo; 1974 - Founder and Director of National Youth Leadership Training Centre. ; 1984 - National Youth Director for Brazilian Bishop's Conference 1984-1990 & member of Latin American Youth Co-Ordination Team for Latin American Bishops. ; 1996 - PhD; Doctor of Philosophy (Leadership in the Church) Fordham University, New York; 2018 - Superior Holy Ghost Congregation (Spiritans) Brazil South West. Fr George spoke of his vocation, the troubled times of the church and the need to work together. He is the author of different books on methodology of youth work published in Portuguese, Spanish, English, German, and Ukrainian languages. Time and time again in his homily, he returned to the youth and their importance in growing the church. Fr George thanked everyone for attending and had a special word of appreciation for the Male Voice Choir conducted by Claire McHugh. Presentations were made to by Chair of the Parish Pastoral Council Anna Creedon and Chair of the Castlecomer Municipal District, Cllr Michael McCarthy. Ms Creedon thanked Fr George for his missionary work and was delighted on behalf of the Pastoral Council to present a donation to assist with that valuable work. Cllr McCarthy presented Fr Geroge with a framed Municipal scroll on behalf of the elected members, which Cllr Maurice Shortall had requested. “This is the first time such an honour has been bestowed at Municipal level, and it is so appropriate that it should be made to a Castlecomer man in his home municipal town," he said. Afterwards all were treated to refreshments in the Community Hall courtesy of the Hospitality Committee.